Explore the world of mosses, liverworts, and hornworts from scientific and artistic perspectives! 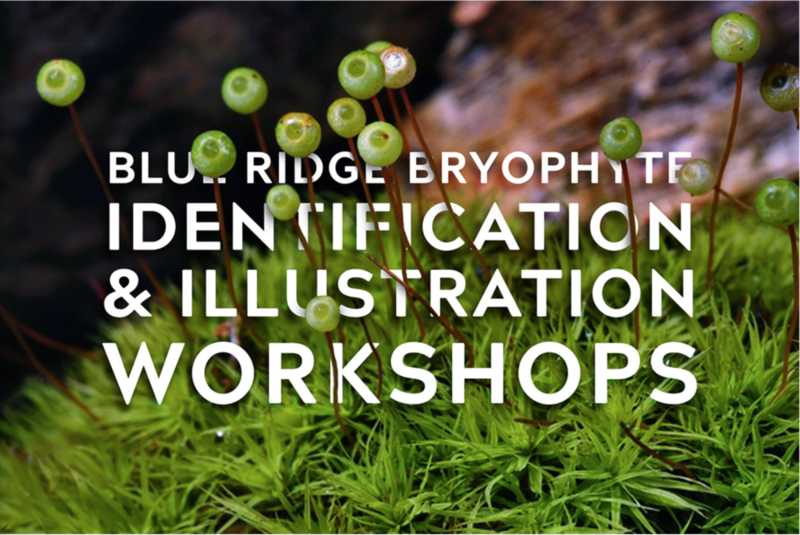 Workshops covering the identification and illustration of bryophytes will be offered on an a la carte basis over two days. The first day will focus on bryophyte identification and will be led by Dr. Blanka Aguero from Duke University. Students will work with their own collections and herbarium specimens to master identification techniques and terminology. The second day will cover illustration, with pen and watercolor illustration workshops, and a free demonstration seminar. Participants will be guided by botanical artist Lara Call Gastinger and have living and preserved moss samples available for illustration. Moss assemblage. Photo by Joseph Reagle. The workshops will take place on March 12-13 in Derring Hall on the Virginia Tech campus. All events are sponsored by the VT Massey Herbarium. Acrobolbus ciliatus photo by Blanka Aguero. On Tuesday, March 12 Dr. Blanka Aguero will lead an identification workshop focused on intermediate or advanced beginner students. Participants are encouraged to bring their own samples for identification. Laboratory materials and microscopes will be available. The session will last from 9am-5pm. Lunch will be provided. Tuition: $120. 12 student capacity. DR. BLANKA AGUERO is an Herbarium Data Manager in the Duke University Cryptogamic Herbarium. She received her Ph.D. in bryophyte systematics from Charles University in Prague, Czech Republic, on the moss genus Philonotis. She has conducted extensive floristic and ecological work in Europe, North America, and around the world. She is a co-author, with Jon Shaw and Lewis Anderson, of a peat moss revision for the southeastern United States, published in 2009. She has substantial experience photographing mosses and liverworts in the field. Blanca’s current research focuses on the liverwort genus Frullania. She has participated in a multi-institutional project aimed at reconstructing phylogenetic relationships across all of liverworts, with an emphasis on leafy groups (the liverwort “tree of life”). Illustrations by Lara Call Gastinger. On Wednesday, March 13 Lara Call Gastinger will guide three events demonstrating and teaching the botanical illustration of bryophytes. The events will be held in Derring Hall, room 2084. LARA CALL GASTINGER is a botanical artist and illustrator in Charlottesville, Virginia. She was the chief illustrator for the Flora of Virginia Project after she received her master’s degree from Virginia Tech in Plant Ecology. She has been awarded two gold medals (2018, 2007) at the Royal Horticultural Society garden show in London and her work has been in several ASBA traveling exhibits and catalogs. Her painting was accepted into the Hunt Institute for Botanical Documentation. Her work can be followed at www.instagram.com/laragastinger. The subjects of her art come from the natural world and reveal detailed evidence of change, decay, and processes that occur in nature. She strives to make a plant portrait in such a way that it reveals its character and uniqueness. Her focus is on the small details in nature, down to the small venations in leaves, which hopefully inspires others to look deeper and pause a bit longer. Contact Dr. Jordan Metzgar with questions about the event.